A large portion of the world's discarded food is tossed after it reaches the homes of consumers. According to the Calgary Herald, half the food waste in Canada is generated in the home, and the average family throws away more than $1,000 of uneaten food each year. Within the food supply chain, this also represents a loss of water, soil, resources and time for the companies that produce the food. While the level of waste of is always disconcerting, it's even worse for an organization when it occurs before the food has been sold to the end consumer. Well before it hits the fridge, there are supply chain hiccups that cause perfectly good food to end up at the landfill. If the average family in Canada discards more than $1,000 each year, it's frightening to imagine what large companies in the food supply chain must throw away before generating any revenue. Loss in the supply chain usually results from poor inventory management. Merchandise reaches or approaches an expiration date before it can reach the consumer. This is due to a number of different factors, including poor data collection. With paper-based data collection, errors are common and information moves slowly. Without the improved traceability of automated data collection, a company does not have a real-time view of its supply chain. One big step in improving inventory control is the use of license plating or pallet labeling. Pallet labeling coupled with barcode or RFID scanning solutions reduces human error and increases the accuracy of inventory. All products with a similar batch number, lot number or expiration date can be shipped and tracked on a single pallet. 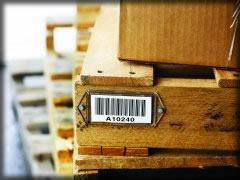 The barcode on the pallet will hold the information of all the products associated with it. Increase Speed: Licensing plating is the quickest way to move inventory while also tracking and logging important data. Control Inventory: Grouping and moving material by a pallet label reduces the effort required properly store and move products in a warehouse. Reduce Labor Costs: Inventory is considerably easier to maintain when products contain a license plate, so employees can work efficiently and the company can be more productive. Improve Traceability: A food recall is one of the most costly supply chain interruptions a company can endure. The improved data collection provided by license plating can help track, remove and dispose of all merchandise that is under a government recall. The sooner this process is completed, the less chance there is that company will be hit with fines or penalties. License plating is one of the best ways for companies in the food supply chain to reduce waste and improve efficiency within distribution warehouses, effectively reducing costs and mitigating the expenses of a recall.